» Age: She looks about 20 currently but is truly 100 years in age, at least human years. » Shifter Appearance Written: Not much of Arianda’s features can be seen below her crimson hooded cloak that she wears even when she sleeps. The crimson cloak itself has an emblem on the left side of the cloak, there is a zipper on the same side as well. There is a pocket near her shoulder. There are a couple of strings hanging from the hood with what look like buttons attached to the strings. There are three button on the right side of the hood, one of the buttons depicting a pair of scissors. Under the cloak she is wearing a black zip up jacket that is skin tight. She normally leaves the jacket unzipped due to her lack of caring whether parts of her can be seen or not. Under the jacket she is wearing a bra, and a bra only. She is also wearing shorts that are black and skin tight as well. She wears simple black gloves so she may wield her weapon with ease and without damaging her hands. Another article of clothing that is easily hidden by the cloak is the belt she wears which has a pouch on it. The belt’s pouch is on her right hip. Bound by the belt is her shorts which extend to the top of her thighs. Below her shorts, on her left leg, is a pouch that faces outward. The pouch is full of tools to mainly maintain her weapon. Below that, on her feet, are some orange socks that are about calf high. The shoes, however, are black with silver soles and are heels. There are red stripes about an inch thick that cross the shoes from the bottom of the zipper on the inside of the shoes. The shoes themselves extend to about to top of her ankle and has a button that can clip to another button on the outside of the shoe that can close the shoe. However, she normally leaves it unzipped just because she believes doing so would not restrict her movement.Under her hood, the most prominent features are her eyes, which are a red orange color. She is also wearing headphones that she obtained from the world of the living and decided that they fit her style. Her hair is blonde in color and is bound into a braid on the right side of her head, which protrudes from her hood. In the braid itself there is what appears to be fabric following some strands of hair. It ends at a bow holding the braid and causing the remaining hair to fall straight from then on. » True Appearance Written: In her demon form her skin takes on a shade of dark red. She grows horns that aren’t exactly that big. About a foot in length and only an inch thick at the base of the horns. She grows about 10 inches in size and her breasts grow as well. 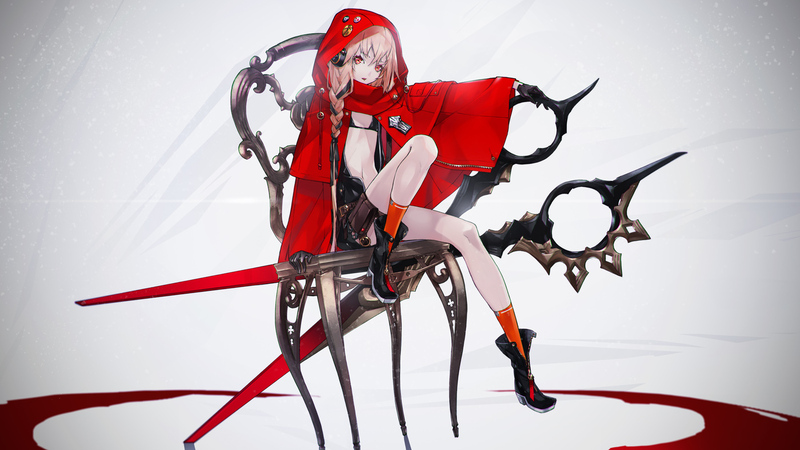 She gains extremely different clothes as well, the red hooded cloak and the rest of her clothes have been replaced with black skin tight pants and a black skin tight shirt. She no longer has any shoes nor gloves. Her skin takes on a scale-like appearance and her hands grow claws to replace the scissor that she uses in her Shifter form. She uses this form if her opponent is truly powerful, and isn’t a waste of her time. » Personality: Arianda is a very interesting demon. She normally likes to keep to herself and is very reserved. At least when she’s in her shifter from. She is normally reserved because she doesn’t want to draw attention to herself despite her strange appearance. She is not a very condescending person unless someone tries to tell her something she already knows. Surprisingly enough whenever she is in this form she tries to act as though she isn’t a demon. However, due to her vast blood lust that she has attained over the years she trained it is impossible for her to act completely like a human. The looks she gives and the aura she has are dead giveaways that she is not human nor hollow. However, in her true form she is very condescending and is a little crazy. She is very full of herself at times when in her true form. Not only that but, due to the sudden growth she accidentally tends to shove parts of her body into peoples’ faces. However, she pretends like that is on purpose and plays it as if she’s trying to distract her opponent and attack them while they’re distracted. » Likes: Well she likes blood, contrary to her looks she truly does like blood. She also likes to cause people to shed blood. Strangely she adores music from the human world, which is why she had headphones as well as a device to play music on that she stole from the human world at one point. She also likes to eat chocolate, chocolate of any kind truthfully. As long as it tastes good, and is truly chocolate, she will eat it. When it comes to food, she will eat meat. She likes to eat any variation of meat as long as it is cooked and does taste good. She also likes someone who can stand their own, and can deal with abuse of any kind. » Dislikes: Arianda dislikes those who brag, whoever keeps bragging that they are powerful and doesn’t back it up with true strength. She dislikes all humans despite her love for their music and headphones. She also does not like any other foods besides chocolate and meat. She also doesn’t like most other demons due to events that happened in her past. She also dislikes weaklings because it reminds her too much of how she used to be before she got stronger. » History: Arianda, like some demons, was born as a demon. From a very young age she showed expertise in battle with most types of weapons. Throughout the years, as Arya slowly grew, she gained expertise with weapons of different types. One of those weapons being a giant pair of scissors. Even past that, she trained her youth away using mainly the giant scissors as well as training with demon magic a little on the side. Despite her expertise in battle she never truly joined any armies or any sort of forces that the demons have. All she did was train and train, attempting to reach a new level of power. She trained so long and so hard that some believed she was to be quite powerful when she grew up. After a time, some Shinigami somehow got into hell and attempted to attack where she lived. She was, in truth, annoyed by the presence of the Shinigami and she went alone to kill the Shinigami, despite the fact that she was only in her shifter form at the time. Alone she went, to dispose of the Shinigami. When she arrived they laughed at her and one of the Shinigami approached her to bat her out of the way. She promptly beheaded the Shinigami with her scissors, with great ease. She looked at the other Shinigami with a look of pure hate and immense blood lust flowing through her entire being. As she looked at the dead Shinigami in front of her she began to laugh. Laughing evilly now, to the point where the Shinigami have grown slightly scared, she slaughtered the other Shinigami without any hesitation. As she stood amidst the corpses she discovered her immense blood lust, how she loved to battle and to kill. Soon enough her blood lust outgrew her desire to stay at home and she left. Arianda left to different parts of hell, killing whatever she could. She would sometimes venture to the human world, find stray humans and slaughter them just to witness blood other than that of a demon or Shinigami. She never tired of her blood lust, however, she did learn how to control it so she doesn’t kill everyone. She instead found ways to make it so her blood lust and aura wasn’t as prominent as it used to be. She began to wander around dimensions she could reach to learn more and become more powerful if possible. » Natural Abilities: Arianda has Shadow Movement, as well as the normal affinity for hell, sacrificing incantation, Curse Effect, and body manipulation, even though she can’t control body manipulation yet. She has gained the ability to use Shadow Movement quite well due to how much she fought just to sate her blood lust. During her training she gained expertise quickly with Shadow Movement, as well as the ability to use Demonic magic. However, she is only able to use one or two spells, which she can only use one of the two per day. Due to her vast training she has gained an Akuma Kyodo that is rather durable and can resist most attacks, except for those that are meant purely to pierce her defenses. He best ability, however, is that to use weapons. She can use weapons quite easily no matter the type, except for any modern weapons like firearms. She has mastery with the giant pair of scissors she wields instead of normal weapons. She can cause the scissors to split at the joint and use them as two separate swords. However, she can also spin the scissors around and slice with them as if they are a giant great sword. » Unique Abilities: While Arianda is not the most powerful demon in the world, she is definitely quite powerful in comparison to her age. Abnormal Reiatsu: While Arianda may not have the strongest reiatsu she has the reiatsu about the equivalent of a 4th seat in the soul society. She likely would’ve been able to gain quite a rank in a demon army if it wasn’t for the fact that she doesn’t care who she kills. All she wants to do is sate her blood lust with battle, which is what caused her to become rogue. Increased Strength: At a young age Arianda trained and trained, getting as strong as she could. She kept on training and fighting to further improve her strength just for the sake of getting stronger. Because of this she gained abnormal strength, even for that of a demon. This abnormal strength allows her to wield the giant pair of scissors she uses as her weapon. It also allows her to lift heavy objects up to 300 pounds in weight. » Adjustable State Appearance: Her first transformation looks a lot like her true demon appearance. However, she grows wings, fangs, and another pair of arms. Her claws also grow in length and become more durable than a Zanpakutō. Her hair grows extremely long and changes red, looking as though it could cut someone. Her horns actually fade at this point and her eyes become far more demonic, and change from an orange-like color to a dark blue. The wings she obtains grow to be about a 40 feet wingspan when fully extended. » Adjustable State Benefits: In her first transformation Arianda mainly gains an upgrade to her current abilities as well as general improvements to survivability in battle. Demonic Strength: Her strength is augmented even further, allowing her to pick up objects up to 600 pounds instead of her normal 300. It also allows her to use her giant scissors, if she wishes to use them, to full capability. Enhanced Speed: Her own speed nearly doubles while she only gets a little bit faster with Shadow Movement. As a comparison from her Shifter form she is able to move fast enough that it nearly seems like she’s using a slower Shadow Movement. Natural Weapons: Her claws grow to be quite a bit larger, at least 2 inches long each. Each claw has the strength of a Zanpakutō but is far more durable than a Zanpakutō itself. Her claws have the capability to break a Zanpakutō if the users reiatsu isn’t focused into the blade well enough. However, the same cannot happen against a Shinigami’s Bankai. Increased Durability: Her skin lives up to its scale-like appearance and becomes much more durable than it used to be. Her skin becomes powerful enough to deflect most Zanpakutō unless they are in Shikai or Bankai. Her skin also has some resistance to most Kido. This allows her to have resistance up to 35, however, any kido past 35 will break through her skin and cause damage progressively or trap her depending on the Bakudo. Flight: This transformation allows Arianda to have flight as long as she has the energy to and she is manipulating her Zoa Koa energy properly to maintain the webbing of her wings. Increased Reiatsu: While in this state her reiatsu seems to nearly double. This can cause her spiritual pressure to be crushing. However, she may not be able to handle herself against a 0-tier even with this large amount of reiatsu until she gets stronger. » Adjustable Demonic States: Arianda only has 1 transformation at the moment since she believes there is no true need to have more than one transformation in the foreseeable future.